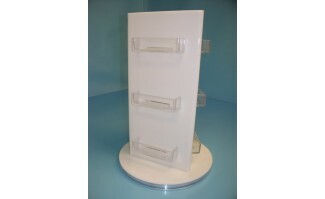 Our 3 sided acrylic gift card display for 9 pockets is made from white acrylic to highlight your cards. The gift card pockets are 3.5" wide x 1" tall and is mounted on a turn table. We can also do printing or custom sizes. Made in the USA.